What is Kannaway? - Read this Review Before You Join!!! >> What is Kannaway? – Read this before you join! What is Kannaway? Is it legit or a scam? 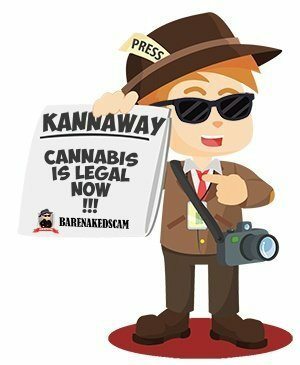 Since the legalization of Cannabis in several states of the U.S. back in 2013, Kannaway prides itself as the first Multi-Level Marketing Company in the industry. Since then, many competitors like HempWorx, CTFO, Hemp Herbals, Prime My Body, and many more have entered the market. 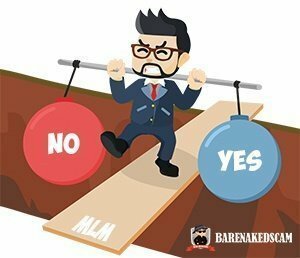 Right at this moment, hundreds of companies (MLM and non-MLM) are competing for a share of this billion dollar industry. What are things you should know before buying CBD Oil? Should you join Kannaway as a Brand Ambassador? These are the questions that will be answered in this Kannaway review. I will also share with you a dirty secret of the CBD industry. What Should You Know Before Buying CBD Oil? #1 How Pure are the CBD Products? Lab Tested? #2 Is the Lab Tester Accredited and Independent? #3 How Much Does It Cost? 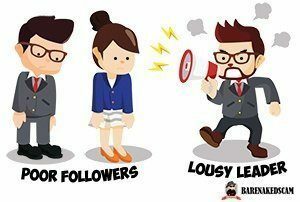 Why More Than 95% of the Brand Ambassadors Fail? Is The Compensation Plan Profitable? Is Kannaway a Pyramid Scheme? Does the Company or it's Brand Ambassadors Deceive Consumers? 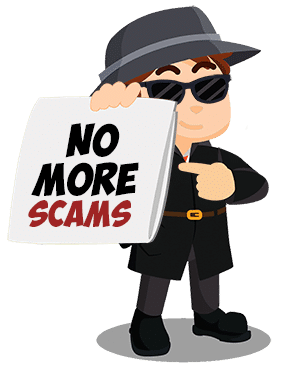 How to Protect Yourself From A Kannaway Scam? There are vast benefits for consuming CBD oil, and if you are still unsure how it works on our body, you can read this. How Pure are the CBD Products? Is the lab tester accredited and independent? If any company claims their CBD products are the purest, but they do not provide proof, then there is no reason to buy from them. Almost every company that sells CBD products will have their products lab tested for its purity. 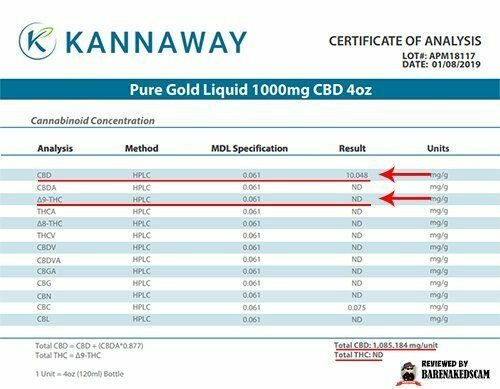 Kannaway did a lab test on their products, and the results can be found here. 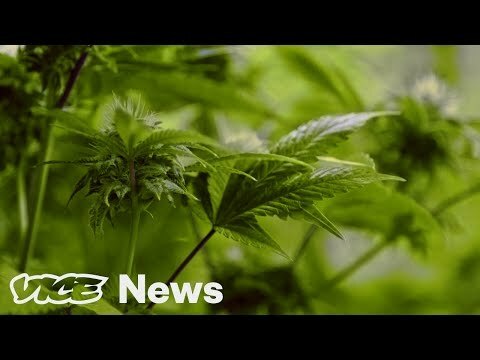 Though Kannaway is not upfront about who the lab tester is, I've found a video that links to Proverde Laboratories. It is the same lab used by Hempworx. Disclaimer: It is not certain that Proverde Laboratories is the lab tester for Kannaway. The video below is not published by the company. Having a lab test result isn't enough! You'll need to dig a little further into the lab tester. The Lab Test Results can be doctored! Now to be clear, I am NOT saying that Kannaway's lab test results are doctored. I intend to help you view the CBD and Hemp industry as a whole. Our best bet for the purest CBD oil is if they are lab tested by laboratories that are accredited in accordance with the ISO/IEC 17025:2005. Having said that, Proverde Laboratories is an accredited lab. So, if Kannaway is lab tested by them, then we can rest easy. The Concentration - You need to verify if the CBD Concentration on the product label matches the lab test results. Amount of THC compound - The CBD is legal with the condition that the THC compound present is lesser than 0.3%. In the lab test results provided by Kannaway below, the products pass both the test mentioned above. Expensive Doesn't Mean That It Is High-Quality! I know, we are conditioned to believe that. 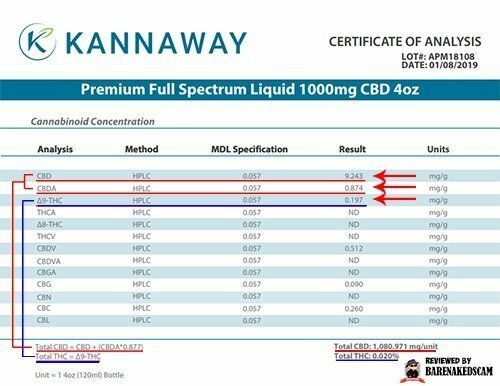 In the case of Kannaway, it sells one of the most expensive CBD oil on the market. Analyzing this price list, you can see that the CBD oils sold by MLM companies (as highlighted) are usually more expensive than the others. This is not a coincidence, but a common practice across the MLM industry. Note: NOT all products sold by MLM companies are more expensive. The reason for the higher price is because the company needs to support its compensation plan. We will talk more about it later. Now, if you are interested in buying CBD oil from a Non-MLM company, I would highly suggest that you visit Cbdoilusers.com. I hope that I have provided you with good knowledge about the factors to consider before buying CBD products from any company. The next question is, "Should You Join Kannaway as a Brand Ambassador?" 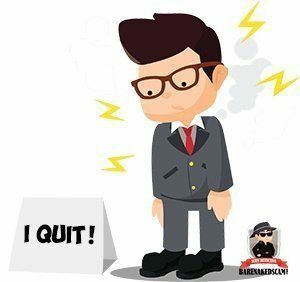 Click Here: How To Quit Your Job And Still Earn A Full-Time Income Online? I have shared the 8 most important questions to ask yourself before joining a company like Kannaway. But, I want to go more in-depth as to the challenges that you will face as a brand consultant. As you know, CBD is a commodity, all products on the market shares the same benefit, and there is little to no differentiation. In terms of quality, I believe Kannaway provides the assurance to its consumers. But, when it comes to the price, Kannaway is ranked as one of the most expensive ones. In my opinion, it is going to be an uphill battle for brand ambassadors to sell Kannaway products. Let us date back to the days where Kannaway is launched in 2014. 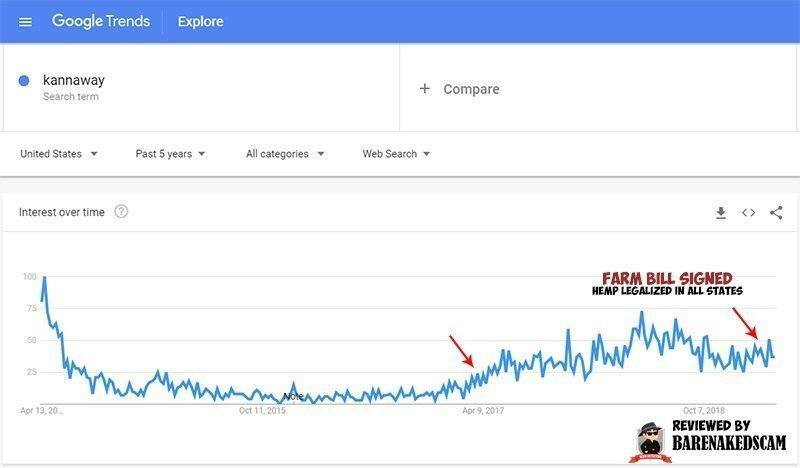 As you can see from the image below, the company has generated a massive public interest, according to MLM Rankings, but the trend slowly died through 2015. If you follow the CBD market news closely, you will see that there are a lot of speculations in late 2017 which leads to the Farm Bill signed by Donald Trump on December 2018 that legalizes Hemp in all states. And that's why there is a spike in the public interest since 2017. Following this, I believe that the CBD market will become global in years to come. As the market is moving in the right direction, it means that there will be more and more competition. The company that can sell the best quality product with the lowest price will win. We have seen this time and time again in the commodity market. 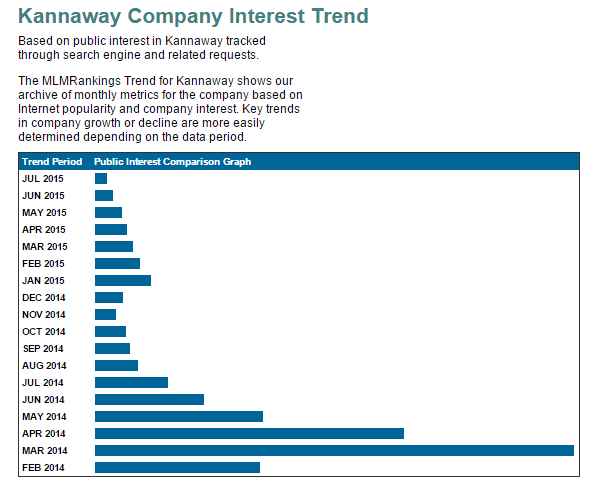 So, it wouldn't be long till Kannaway loses their market share to a more cost-efficient company. That's unless they become more competitive, or they produce a unique CBD product that the market needs. Right at this moment in April 2019, CBD is still considered a drug ingredient in the eyes of the Food and Drug Administration (FDA). Which means that it is still illegal to add CBD to food and health products unless approved by the FDA. Now that we have a macro view of everything, let's talk about the independent Brand Ambassadors. It is the exact opposite for sales associates (brand ambassadors). For most brand ambassadors, their warm market (meaning their friends, family, and people they know) is their only prospects. They were taught to sell Kannaway's products to their warm market, and get referrals from them. But the fact is, the referrals will eventually run dry. It will come to a point where ambassadors will feel stuck and cannot progress with the business. Out of meeting 100 prospects, maybe 20 of them will be interested in the products, but 3 of the 20 will buy a product. And if lucky, 1 will join as a Brand Ambassador. As you know, the only way to succeed with Kannaway is by recruiting. The more people in your team who are out there promoting Kannaway's products, the more money you will make. More will be discussed in the compensation plan below. So with that, if you are only relying on your warm market, it is almost impossible to succeed. Click Here: Learn How to Find an Endless Stream of Prospects For Your Kannaway Business. This is one of the most critical factors that will determine your success or failure in the business. Especially when you do not have any prior sales experience, your upline or sponsor is probably the only person you can rely on for support and guidance. And more likely than not, your sponsor will teach you the traditional way of marketing, which is a strategy that does not work anymore. It is NOT because your sponsor deliberately wants you to fail, but it is because that's the only strategy that she/he knows. And probably, she/he did not achieve results themselves. This is a situation where we called "the blind leading the blind." 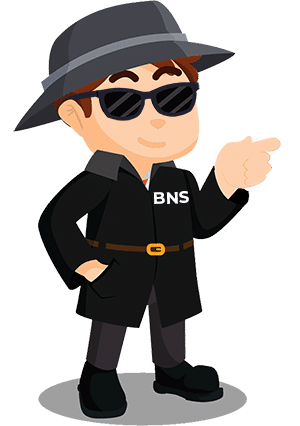 As you know, there is only a handful of successful brand ambassadors, so it is tough to find someone successful who will groom you into a better network marketer. I would say unless you have direct access to top earners who are willing to coach you or share their success secrets with you, your chance of success is rather slim. Not many people are aware that facing rejection daily is part and parcel of this business. It is only when they are in it, that they feel it is not the right business for them. I want to congratulate you for reading this! Because now you will know if the Kannaway business is suitable for. Unless you have prior sales experience, you will find it tough to succeed in this business. I would say that it takes probably 1 to 2 years to master salesmanship. And within this period, you shouldn't expect to earn much money. This is a tough business, and not many people are willing to go down this path. This is perhaps the reason why so many people fail. Kannaway Not a Suitable Business For You? Try this! Understanding the Kannaway's compensation plan is not easy (especially the direct sales commission). There are 10 methods to earn money from the company. After watching the video below, I will explain some of the methods that are "not that straight forward." The first 30 days of a new customer or Brand Ambassador that you enrolled is the most crucial. Because, you will be paid 30% of the commission-able volume. What is commission-able volume? Good question! Kannaway sure doesn't make it easy. Commission-able volume (CV) is 50% of the Business Volume. Business Volume (BV) is the number that is tagged to each product sold on Kannaway. All commission will be calculated based on the Business Volume. Here is the price list (with the Business Volume). Note: The commission earned from selling a Value pack (see image below) is different from the sales of a separate item (À la carte). Let us take the above image as an example to calculate your commission. which makes 55 Commission-able Volume. Then, your commission rate is 30% of the commission-able volume. 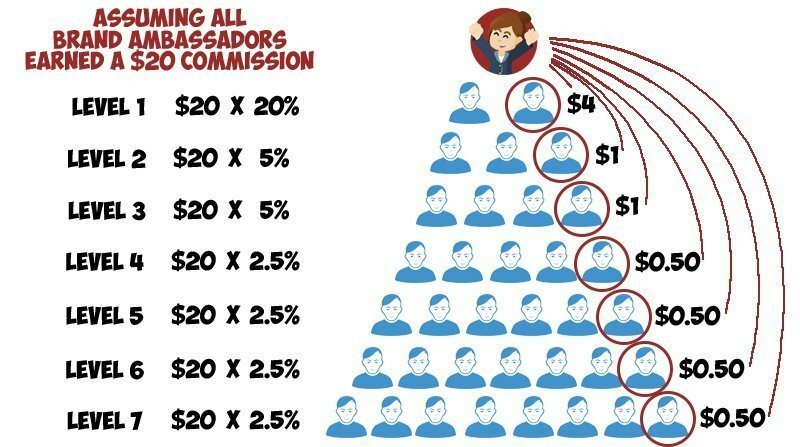 So, 30% of the 55 commission-able Volume, will earn you US$16.50. This calculation is if you sold a separate (À la carte) product. But, if you've sold a value pack, the commission amount will be based on a fixed rate (refer to image above). How to be fast start qualified? Refer to the compensation plan. How to achieve the ranks? There is a table below. What this means is that as long as you've achieved one of these ranks, you will be guaranteed a minimum income as shown above. However, there are strict requirements to achieve one of these ranks and to maintain it. Active Brand Ambassador = A person who pays the Annual Brand Ambassador Fee of $54.98 per year. Personal Volume (PV) = Total amount of Business Volume (BV) you've personally purchased or sold. Group Volume (GV) = Total amount of monthly sales generated by your team of brand ambassadors. Including brand ambassadors passed down by your uplines. Alright, I think these are the complicated ones that should be explained further. I hope I have done a good job. If you still have questions about the compensation plan, feel free to leave it in the comments section below. As I walk you through the compensation plan, you probably understand why Kannaway's products are more expensive than those on the market. It is not about the quality of the products, but more about supporting the compensation plan. Now, I am not saying that this is a bad business practice, or that this is a scam. 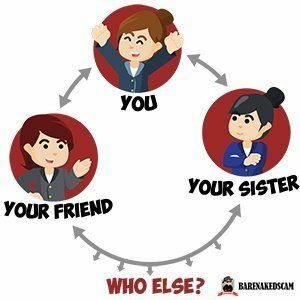 This is a common practice in the Multi-Level Marketing industry, and it is legal. 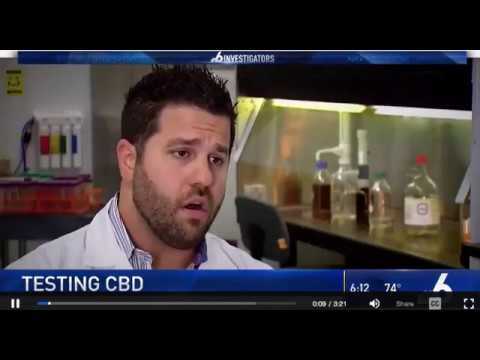 I am saying that there is a disadvantage to consumers who just want to buy a CBD product. Maybe the consumer will value the quality assurance offered by the company, and they don't mind paying the extra. But what they are really paying for is the compensation plan. You must be wondering why I wanted to keep this critical section so far down this review. It is because there are so many things to discuss about the Kannaway products and the business opportunity that leads to this conclusion. If you haven't read the above yet, I highly suggest that you do so. In this sense, the commission paid by Kannaway to its brand ambassadors is through the product sales. And, we already know that the product is a commodity that consumers need and want. Though the prices of the products are a little inflated, it doesn't force its consumers or its brand ambassadors to buy inventory for re-selling. Finally, their products are sold to the general public at a retail price. So, Kannaway may not be considered a pyramid scheme. May not? Let me explain. No matter how legitimate Kannaway is, there will be a group of ambassadors who will give the company a bad name. They will make it appear that the Kannaway's business opportunity is an easy way to earn money. And, they only focus on recruiting unknowing individuals and teaching them how to do the same thing (recruiting). This is an illegal practice, and if you were roped into Kannaway the same way as I've described (a recruitment scheme), you know what to do. I would say to avoid getting into a recruitment scheme, you should only join Kannaway if you've benefited from the product, and you would like to share the products with others. As far as I know, they don't. Although Kannaway's support team isn't the best, and they were slow in their response back in 2017, it seems that they have improved. 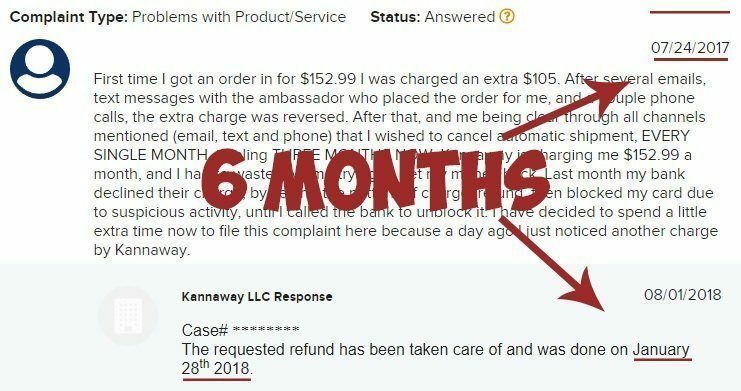 If you examine the image adapted from BBB, you will notice that this particular consumer got the refund only after 6 months. However, there hasn't been much complains since then. But, if you have a bad experience with the company and you would like to share it, feel free to leave it in the comments section below. Now, the next issue is, some brand ambassadors went way beyond the boundary and claimed that Kannaway's CBD oil cures cancer and diseases. While we know that there is a possibility of that happening in the future, ambassadors still can't make such a claim. Those ambassadors were either intentional or ignorant to the fact that such an act will go against the company's policy as well as breaking the law. So to answer the question about deception, I don't think that the company deceives their consumers at the top level. It is a small group of ambassadors who will give the company a bad name. 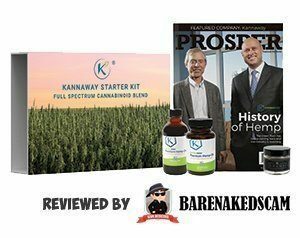 Verdict: Based on all the assessment above, I conclude that Kannaway is not a scam. What do you think? Please share your opinion with me in the comments section. You should only join Kannaway as an ambassador if you have benefited from the products, and you want to share it with others. Money should never be the primary reason to join. Let me know in the comments section if the pointers above help. If you love Kannaway's products and you would like to share it with the people around you, then it makes total sense to join as a brand ambassador. However, note that it is not an easy path. If you want to increase your chance of success, I would highly suggest that you learn a strategy called "Attraction Marketing." It is a strategy that will allow you to attract the right people into your business, instead of you going out to find them. If you are interested to learn more, this program teaches it best. 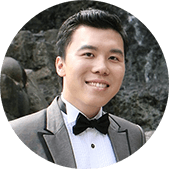 However, if you don't think that the Kannaway business is suitable for you, then you might be interested to learn about the top 3 ways to earn money online. In my opinion, the best way out of the 3 is Affiliate Marketing, and this program has the most success stories by far. Here's my success story if you are interested. Thank you so much for reading this Kannaway review! I hope that I have provided you with a 360-degree view of the company and its business as a whole. If you find this review helpful, please share it with it! There might be others who are looking for this information. All the best to you and I hope that you will find success in whichever decision you make! 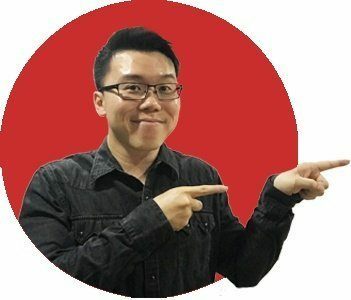 Jack is an experienced online marketer who has the passion to help beginners succeed online. Enter your name and your best email and click the button below to gain instant access. 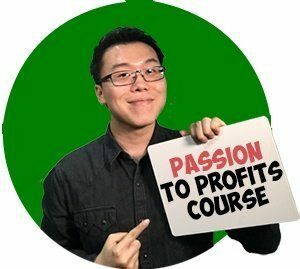 THE PASSION TO PROFITS COURSE TO?